Engaging youth with fun, interesting activities is essential to establishing a strong youth ministry program. When working with teenagers, choose games that challenge them to learn while maintaining an element of fun. These Bible-based games are good learning tools and ice-breaking activities for teenagers. Playing a game of Bible Jeopardy teaches teenagers more about their faith while allowing them to engage in friendly competition. Choose five general categories of clues, such as prophets, commandments, beatitudes, or books of the Bible. For each category, write five increasingly difficult clues in the form of an answer. For example, "The book in which Moses leads the Israelites out of Egypt" has the answer, "What is Exodus?" Allow teens to take turns choosing categories and earning points. 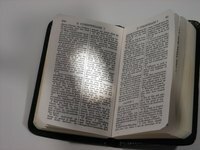 Make a list of people mentioned in the Bible as an apostle, king or prophet. Choose a mixture of well-known and obscure people. Form teams and ask teens to decide if a name corresponds to an apostle, king or prophet. This is an easy and fun way for students to learn Biblical figures and their roles. Write the names of people from the Bible on pieces of paper. Have each teen choose a piece of paper and, without reading it, tape the paper to his forehead. He now takes the role of that Biblical figure without knowing who it is. To succeed at the game, each person must figure out what character he is by talking to others who give him descriptive clues. Create several pairs of two seemingly unrelated Biblical figures. Allow teens to work in teams to try to determine a connection between the two people through other people they knew or interacted with in the Bible. The group that figures out a connection with six or fewer degrees of separation wins. This is a challenging Bible-related memory game that teenagers will enjoy. Begin by choosing a Biblical figure whose name begins with A (such as Adam) and saying, "I am going on a trip with Adam." The next person must choose a B name and say, "I am going on a trip with Adam and Benjamin." Keep moving down the alphabet and adding names in order until someone remembers the entire list of people going on the imaginary trip.